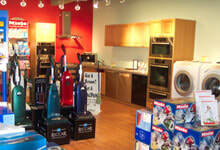 North Shore Vacuum and Appliance takes pride in selling Miele vacuum cleaners to Salem MA residents and businesses. Miele vacuum cleaners, whether residential or industrial, are top-of-the-line machines that are built to be long-lasting, but cost far less than other leading brands. In addition to Miele vacuum cleaners, we proudly offer a full line of brand appliances and replacement parts. Since we opened our doors in 1934, North Shore Vacuum and Appliance has dedicated itself to providing our customers with the customer service you are looking for and superior products, like our Miele vacuum cleaners. Residents and businesses throughout greater Salem MA continue to have access to such quality vacuum cleaners and other appliances thanks to our new, ongoing relationship with Miele and other top brands. When it comes to Miele vacuum cleaners, no other surrounding businesses carry the quantity we do. To view our full line, stop by our shop today at a time that works for you. We are conveniently open six days a week, and until 8 p.m. every Tuesday. Or to schedule an appointment to discuss Miele vacuum cleaners, Salem MA area residents can call (781) 595-1455 today.